Familia Feliz is a fairly new project which was begun in August of 2005 with 5 children. The property consists of 250 acres in the jungle and is located about 10 miles south of the town of Rurrenabaque, Bolivia, which is at the edge of the Madidi National Park. In 2005 a 22 yr. old girl stepped onto the plane with her ticket in her pocket, her guitar on her shoulder, and a dream. She wanted to start an orphanage in Bolivia someday, and this was going to be her first exploratory excursion. God smiled and said, “I have My own plans. I can take her ignorance and naietivity, combine them with My many other resources, and start one now.” In 2006 Familia Feliz started their first school year. It was not long before Melissa realized that although she had dreamed of an orphanage, it was not the administrating, but actual childcare that she felt a call to. 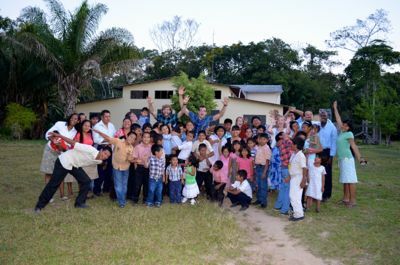 Familia Feliz, operating under the auspices of Gospel Ministries, has had several different administrators, while Melissa has since adopted a large family of children, while staying closely connected with the orphanage. The goal of Familia Feliz is to provide emotional, physical and spiritual support in a family environment and to help these children grow and realize their full potential. We take in children that in North America, would be placed either for adoption, or in a foster care home. Sometimes there are no parents, but often there is physical and/or sexuall abuse, abandonment and neglect, and in some cases extreme poverty. Supported entirely by donation, (Gospel Ministries does not give any funds, only legal and promotional), and operated by volunteers this school is a monument to God’s care and the love and support of hundreds of friends with love and commitment in their hearts.